Decorative concrete is one of the hottest trends in home design, thanks to its versatility, durability and affordability. From decorative concrete patios, pool decks and driveways, to interior floors, countertops and more, decorative concrete can turn boring gray concrete into a design statement that wows. Choose from a multitude of concrete textures, patterns and colors to create a unique concrete design element for your home, office or place of business. Slate, granite, natural stone tile, brick…the design possibilities are endless. Choose a texture to fit your design theme, or mix and match textures for contrast and style. Often, the project will dictate the texture. For example, a smooth texture works well for a countertop or driveway, while a textured, porous surface may be more appropriate for a pool deck. Intermountain Concrete Specialists’ expert staff can help you choose the right texture for your decorative concrete project. Pattern sets the tone for the overall look of any decorative concrete project, so this decision requires a look at the big picture. Is the surface interior or exterior? How large is the area? While larger, grouted patterns are more pleasing to larger areas, smaller patterns can be more appealing on interiors, patios and garden pathways. Geometric patterns with hard edges often work well in interior spaces and driveways, while curved patterns can create a serene outdoor space. Intermountain Concrete Specialists carries a wide selection of texture mats, skins and stamping tools for a variety of natural-looking and man-made pattern options. 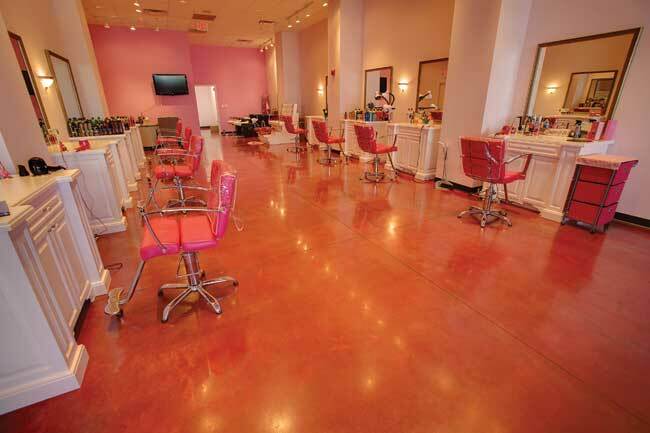 Colors enhance the pattern and texture of decorative concrete, and have a huge impact on the overall design. Different color materials achieve different effects. Choose from integral colors, chemical stains, acid stains, water-based stains, color hardeners, antique releases and colored coatings to create natural or engineered color surfaces. Be sure to prepare a sample, so you know exactly what the final color will be. Concrete sealers can beautify and enhance your project, just like varnish on wood. Sealers provide protection from sun and water damage, oil stains, dirt, tire marks, and even graffiti. They can deepen and enrich colors, and can even be given a color tint. Choose from high, medium or low gloss, as well as slip-resistant and water-based environmentally friendly sealers. Visit the Intermountain Concrete Specialties showroom nearest you where our expert staff can show you how decorative concrete can enhance your space. We have a wide supply of architectural and decorative concrete products, equipment and knowledge to help you create any project!